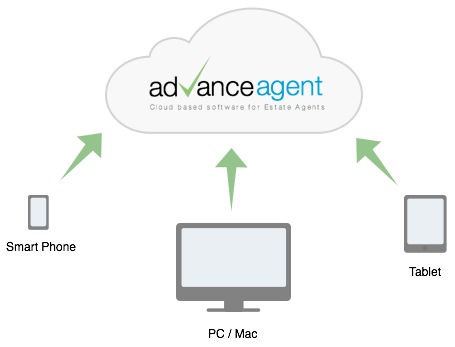 Advance Agent is a cloud based software platform for Estate Agents. It allows Estate Agents to manage their properties, offers, sales, vendors, applicants and more from any internet connected device. Forget buying and managing expensive servers hosted in your office or maintaining your own IT staff, we manage your software for you, your account will be accessible online anywhere in the world, we handle updates, security, backups, network administration and anything else to ensure you can focus on what you do best. Our server infrastructure can scale up and down on demand, if we experience high loads we can add new servers dynamically to cope with the demand. Our systems are monitored 24/7 with checks every 60 seconds from multiple locations around the world. In the event of any service failure on call engineers are alerted by email and sms. Our service level agreement guarantees a minimum of 99.5% availability, our uptime for the past 12 months is 99.96% including planned maintenance performed in off peak hours. Our system status is reported live up to the minute at all times. We maintain full time development staff working on new features and improvements, all of which are made available to our customers at no extra cost. In the last year we have made over 400 updates and announced 12 major new features, so you can relax in the knowledge that Advance Agent will continue to give you the latest tools into the future. Any internet connected device with a modern browser can access Advance Agent, including Mac and PC, Tablets and Smart Phones. Our databases are replicated up to the minute to slaves running on seperate hardware, ensuring in the event of a disaster we have a copy to take over. Assets such as property photos are stored in duplicated, fault tolerant storage and we take full server and database backups every day with a 7 day daily retention and 6 week weekly retention. We take your data seriously. Advance Agent powered websites run directly on top of Advance Agent, allowing for tight integration, speed and flexibility plus the benefits of our robust server infrastructure, monitoring and resources. From first logging into your account you can launch your website in minutes.